Android's head honcho Andy Rubin got up on stage today to say a few quick words about open source and the bright future of tablets, especially the pilot Motorola XOOM. 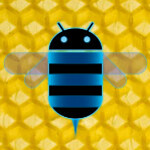 Then he gave the word over to the Android 3.0 Honeycomb development team. They dove into the interface, which we preview here, and then started going into details. The new Renderscript engine allows for rather smooth animations and transitions, which were demonstrated mainly as 3D carousels for browsing YouTube videos, the book library, and the music player album art. All the action on the XOOM tablet screen was rather smooth, but given that this slate with its dual-core NVIDIA Tegra 2 chipset has been used as a reference platform for Honeycomb, we'd expect nothing less. Then the 3D graphics capabilities of the Honeycomb platform were demonstrated with the hack-and-slash Monster Madness, and a new 3D strategy game, Great Battles, which has actually been created from the ground-up to use both cores of dual-core chipsets, thus allowing for hundreds of on-screen battle units working in sync. Great Battles had a dazzling amount of action going on at once on the screen, without the chipset breaking a sweat. Pretty cool that Honeycomb is the first Android version that natively supports multi-core, and actually there will be apps that take advantage of it out of the door. Then they demoed the camera interface, which now fits much more settings on one screen (duh!). Video chat was demonstrated, but a buddy named Lady Killer was not available, so they called a guy called Anand for 10 seconds to demo that video chat actually works. The usual hissing and voice cracks you can expect from these chats were not spared in the demo conversation, but that's how it actually works anyway. CNN took the stage to announce an Android video app they've been developing specifically for Honeycomb. Obviously the Honeycomb apps thing is screen fragments, since in a pane on the left we had the news categories, and on the right up to 350 stories as videos or articles, arranged in a scrollable grid. The streaming video enhancements of Android 3.0 have come in handy while developing the app. CNN's iReport was a part of the application, mainly by showing you the latest iReport thingies uploaded, and two capture buttons down left for you to contribute, and upload right away to CNN's website whatever is happening around you (try overthrowing a government with both hands grasping at a tablet, though). It will keep uploading your iReport even if you do something else in the meantime. Courage under fire is what we call it. The other big things we were expecting today were Web-based Android Market and in-app purchases, and those were indeed announced, although the in-app purchases are coming a bit later. Finally you don't have to have an Android phone handy to browse, buy and push applications OTA to your handset. Video review of the applications are also a part of Android Market for the Web at market.android.com (it is active right now, so you can check it out immediately). Finally, a Disney guy got on stage to announce that they are bringing Radio Disney to Android Market for kids to stream music to their Android devices. Jelly Car and TapTap Revenge are also on tap for Android from the Disney studios. Pretty exciting, and we were most psyched about the fact that Android tablets with Honeycomb already have games, and maybe other apps, that have been created specifically with dual-core in mind. The Web-based Android Market was the cherry on the top, and we are off to take it for a spin. Whenever we stop getting "Invalid request" while trying to log in, that is. What? No announcement of Google Music? Well, shoot. awww no google music? :( whatever, this is still awesome!